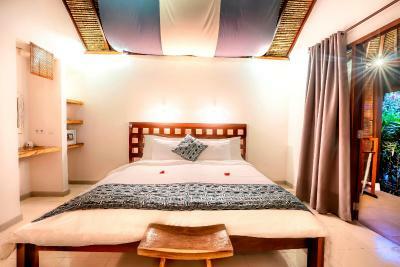 Lock in a great price for Manta Dive Gili Air Resort – rated 8.9 by recent guests! Excellent staff: friendly, courteous, thoroughly will to help in every way. A delightful stay and charming staff. Conveniently located, too! 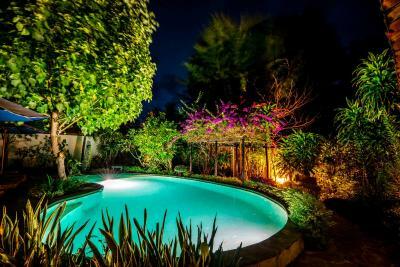 Clean and comfy with beautiful tropical grounds. Very nice and helpful staff. The 'attached' restaurant had excellent service and yummy food (breakfast, lunch and dinner) and also had a nice bar with wonderful service. (Served your beer in a coozie to keep it cold!) Room was very clean, quiet and spacious with working A/C. Bathroom was also very nice and had an outdoor shower. Very short walk to 'town' but also was close to a great selection of restaurants and shops. Would definitely stay here again! The resort facilities were as I expected. Bungallow OK, comfortable bed. The beach is just in front of the resort and you can enter water also in low tide period. 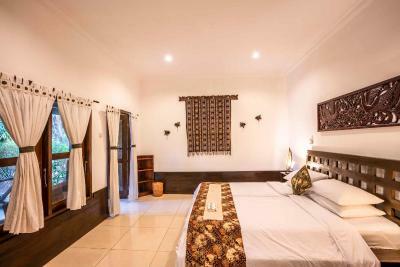 Manta Dive Gili Air Resort This rating is a reflection of how the property compares to the industry standard when it comes to price, facilities and services available. It's based on a self-evaluation by the property. Use this rating to help choose your stay! 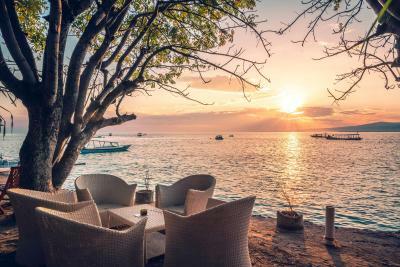 A tropical getaway awaits guests at Manta Dove Gili Air Resort, steps away from the white sandy shores of Gili Air Island. Surrounded by coconut trees and lush greenery, the resort features three outdoor pools for training and swimming, as well as a restaurant. 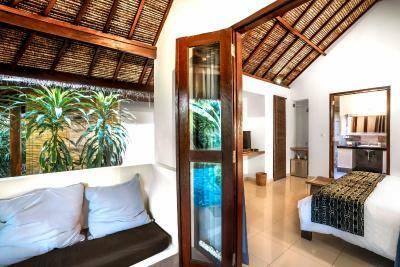 Air-conditioned units in Manta Dove Gili Air are fitted with wooden or tiled flooring. They are well equipped with a personal safe and freshly laundered linen. 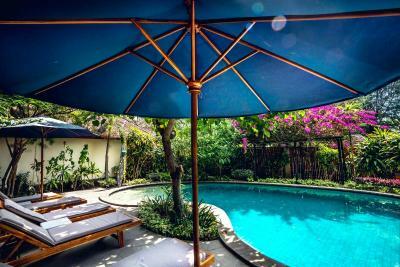 Each comes with a terrace overlooking the pool or garden. 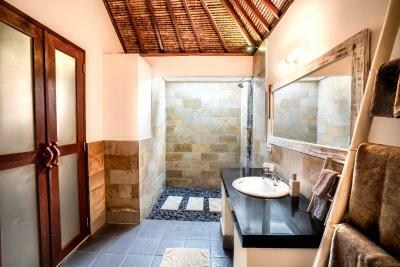 Hot shower facilities are included in the semi open bathrooms. 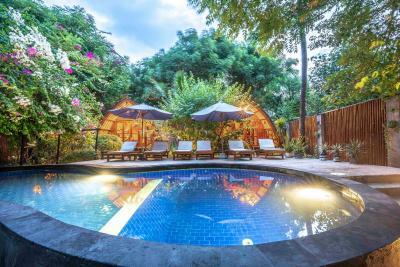 The resort has a diving school for beginners and advanced divers. Guests may request for airport pick-up and sightseeing arrangements. Wi-Fi access is free in public areas. 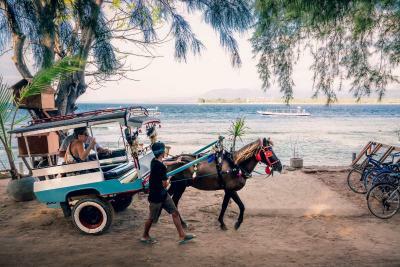 Gili Air Island itself is reachable by a 25-minute boat ride from Bangsal Harbor, which can be reached by a 2-hour car ride from Lombok International Airport. 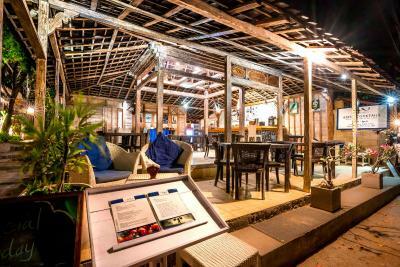 When would you like to stay at Manta Dive Gili Air Resort? Featuring a private terrace with garden views, this air-conditioned room has a safety deposit box and a semi open bathroom with hot shower facilities. 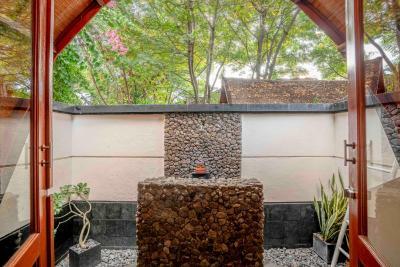 Featuring a private terrace with garden and pool views, this standalone wooden bungalow has a safety deposit box and a semi open bathroom with hot shower facilities. 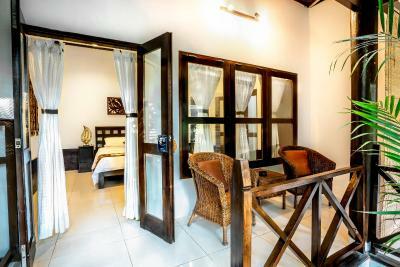 This room features air-conditioning, a shower with hot water, a satellite TV, a personal safe, and a fridge. 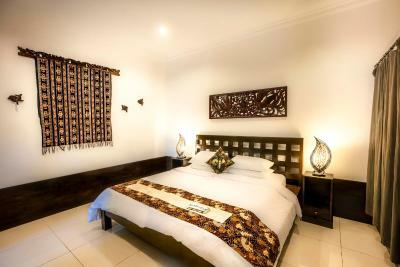 For comfortable accommodation Gili Air has a lot to choose from and Manta Dive Gili Air is not just about diving. 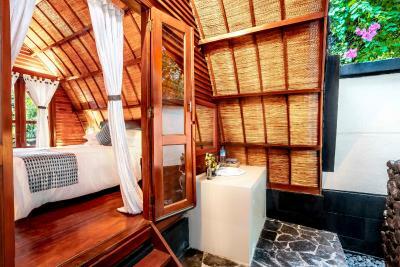 We also have great bungalows for you to relax in during your stay on Gili Air. 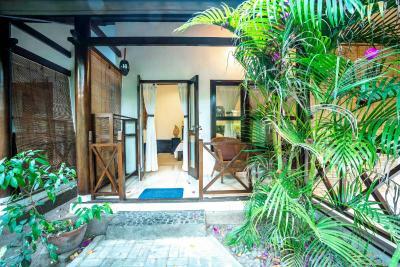 Our bungalows are set in beautiful gardens and have a mix of Indonesian and Western influence. 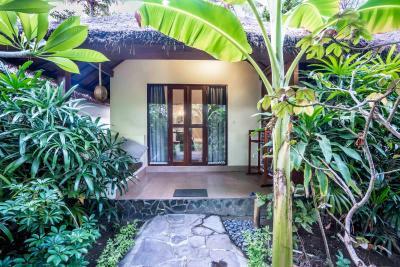 All our bungalows come with standard hotel facilities, including their own terrace, safety deposit box, air conditioning and hot water. 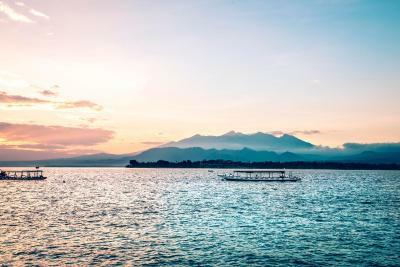 Breakfast can be served on your terrace, or you can sit on the sea front next to our coffee bar and enjoy the view to Mount Rinjani on Lombok. 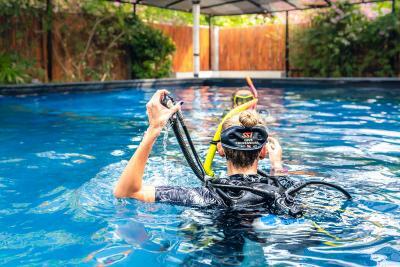 We offer all dive courses from beginner level to professional, with many specialties available such as Enriched Air Nitrox, Digital Underwater Photography, Perfect Buoyancy, Recreational Sidemount, and Wreck. All dive sites are within a 10-25 minute boat journey, which means you actually spend most of your time diving rather than sitting in a boat! We send only two buddy teams with each guide providing you with a very relaxed diving environment. Oxygen, communications equipment, as well as drinking water are standard safety equipment on board. 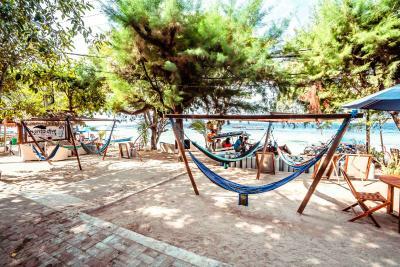 House Rules Manta Dive Gili Air Resort takes special requests – add in the next step! 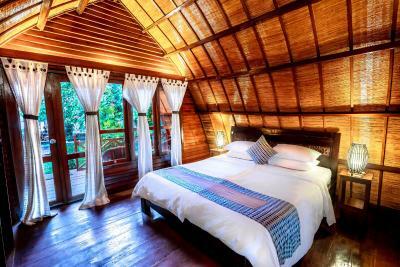 Close to the beach, nice bungalows and very helpful staff! First objective issue - if you want snorkelling, do not come in rainy period. 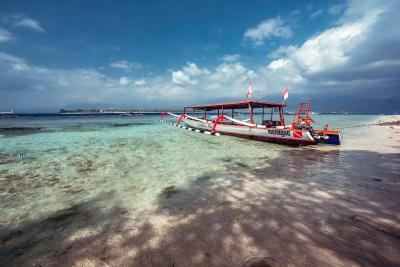 The Gili Air Island is very close to Lombok island and the water is poluted by rainy water from the main island. In some places almost no visibility because of this. Second - seems that diving staff is not very helpful to snorkellers. I asked for advice (also already before the arrival), did not receive good one. I was sent to snorkelling trip - the least "performing" one in my life. 21 persons on not too big boat, problematic selection of sites, compulsory 1,5 hour break for overpriced luch (paid by us). Never ever. Good snorkelling area is at north part of the island, where coral block are still somehow alive. In the rest, more than 90 % of corals are already dead, the only plus is to meet turtles - but with 2 m visibility, you need to hit one. Wear at least full top protection against planktoon. Staff was amazing, very welcoming and friendly. They were on time and their boat is right in front of resort, so no waiting on beach for boat. They rotate between the diving spots, so you always see something new. If you are not into diving, the best snorkeling spots are right in front of the resort and it is walking distance to other spots. There is a beach area right beside the resort, 5 min of walk. The bungalow was awesome, very clean with an outside shower. It was a bit dark in the bungalow, but so cozy. 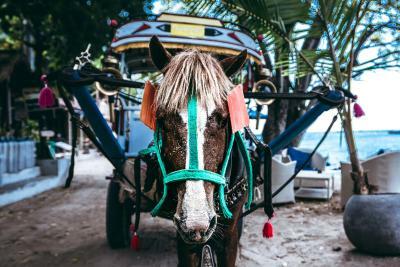 They also offer to organize your transportation and if you wanna book a tour they will point you to the right people. Some frustration with internet connection. Strengthening that would make this place terrific, especially for divers—but others too. Breakfast was slightly average some days. Divemaster could have been a little more attentive to some of the other beginner divers. Stayed here to dive for several days. Nice room looking out over the pool. Pleasant dive centre very close to the beach. Wifi worked fine once we got the correct login. Great staff and management - they did everything they cold to make our stay pleasant. Great and professional dive center. Wifi was not working at the resort but sim cards are cheap and many restaurants around have free wifi. 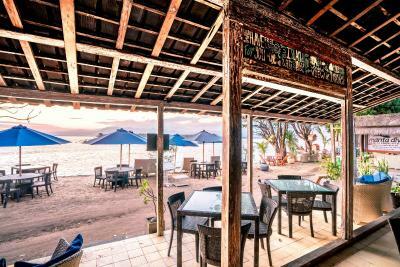 I had a wonderful stay at Manta dive. Rooms are very clean and it's about a 10 min walk from the pier right next to the beach. Great diving outfit with a friendly relaxed community feel. Sad I have to leave. Highly recommend especially if you want to dive. 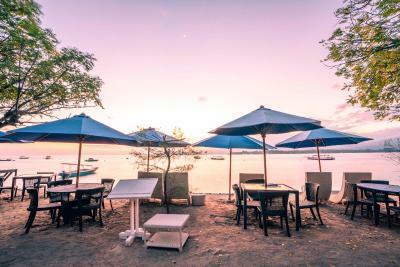 Excellent location - super friendly staff - good restaurant - good breakfast variety - all in all the hotel is definitely recommandable and would most definitely come again! I am so happy I stayed and dove at Manta...this is the best dive resort on the island because of its location on the island (beachfront), wonderful staff and dive guides (special shoutouts to Aurelien, Rafik and Dylan), and the rooms are very comfortable. It was great to meet other divers and new friends - very social and friendly atmosphere. 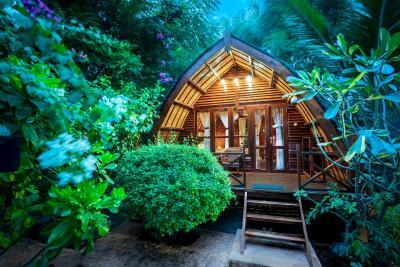 I stayed here for 4 nights and dove 4/5 days...absolutely amazing dive spots all over the Gilis. Thank you SO much Manta!! We stayed in a bungalow. 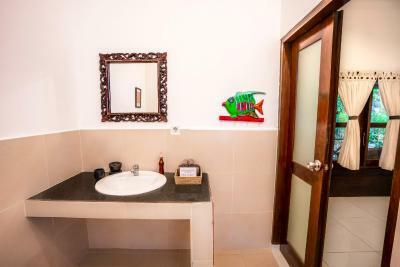 It was very clean, functional with great, spacious bathroom and the best bed on the island! :) We definitely recommend it.